Whenever family and friends gather, pictures are sure to be a part of the day! 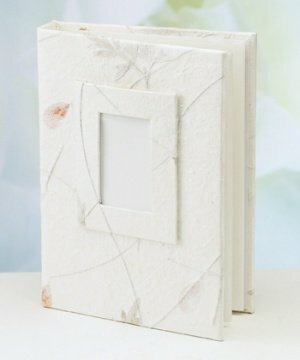 Our Leaf-Patterned Embossed Photo Album Favors are a special way to have your guests display some of the best shots. Each album is 5" x 6-3/4" and holds 40 4" x 6" photos. The opening for the mini photo frame on the front measures 1.5" X 2.25". The colors and natural leaf pattern will vary.